Structure is the way parts are connected to form a whole. All systems are composed of parts and connections. The connections determine how the parts work together, which is what determines how the system behaves as a whole. The most important thing about a system is how it's structured. 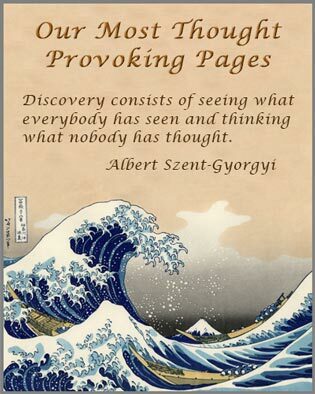 This is systems thinking’s deepest insight. Above are some of the main patterns found in structures. From a structural thinking point of view it doesn't matter where a part (also called a node) is. It only matters what it is connected to. Connections are how one part influences another. Connections have direction. They may be one way or two way. A two way connection is actually two connections in opposite directions between two parts, such as gravity or friendship. emerges from the structure of its parts. Memorize this and it will never fail you. If you don't understand the structure of a difficult problem, then you can't solve the problem. The type of modeling most appropriate to the sustainability problem is system dynamics. This views the structure of a system as consisting of feedback loops made up nodes. Each node represents something in the real world. System dynamics models allow the logical behavior of the structure of a problem to be simulated. These simulations allows you to draw correct insights and conclusions from your models that the unaided mind is unable to do. What's the most powerful structure in the world? Positive feedback loops are the most powerful processes in the universe. Getting a little more mundane, unsustainable growth of the human system's impact on the environmental is obviously due to a runaway positive feedback loop. It's so powerful it's unstoppable. So far. Our challenge is the same as those working on the accelerating universe problem: to build a model that identifies the fundamental structure of the problem. Sometimes certain basic structural patterns will exist in the key feedback loops driving a problem, because so many problems have similar characteristics. Peter Senge and others have catalogued some of these into the family tree shown below. An archetype is a feedback loop pattern found in many problems. The tree may be used to become familiar with these patterns. It may also be useful in taking your first steps toward analyzing a problem and learning system dynamics. However, when tackling insanely difficult large-scale social problems, from Thwink.org's experience the archetypes are not that useful for finding the structural backbone that leads to the root causes. Better is to follow a process designed to fit the problem. We can say this with some assurance. In the Summary of Analysis Results for the environmental sustainability problem, none of the models for the four subproblems involved archetypes. The archetypes do appear in social problems, but they are usually not the key feedback loop structure that creates the root cause forces. To get to that level of analytical depth requires much more than archetypes. What's the Critical Structure of the Sustainability Problem? It's feedback loops. Hidden forces are the source of the problem. 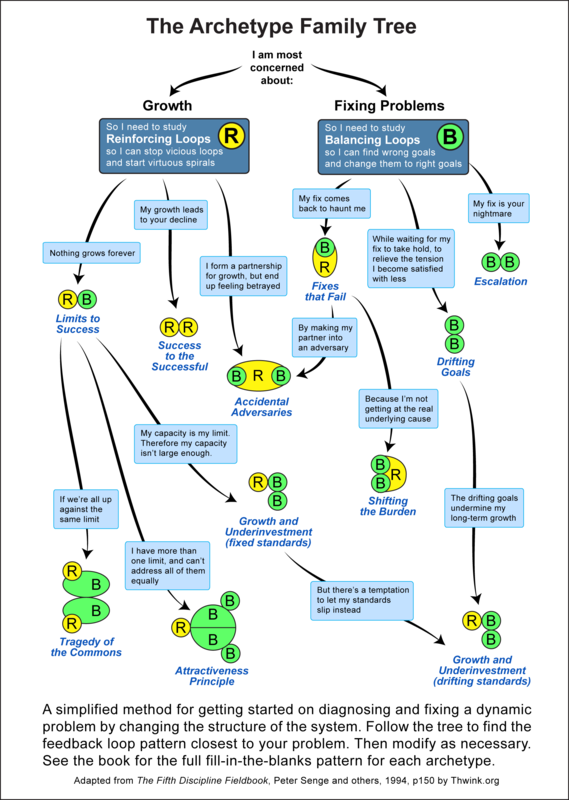 Modeling a system's feedback loops reveals these forces, because each feedback loop is either balancing system behavior (a balancing loop) or reinforcing it to make it grow or shrink (a reinforcing loop). A potential roadblock is people are not accustomed to thinking in terms of feedback loops. They are normally never taught in school or college, unless you take a course in feedback modeling or a subject that uses feedback modeling. Thus the situation we're in is the average person working on the sustainability problem has never learned how to see the critical structure of the problem, which is its important feedback loops. That's easily rectified. 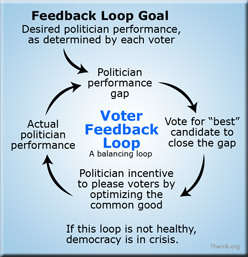 It takes only a little study of how feedback loops work, and perhaps a little sketching of a few causal loop diagrams.